This frame from the report’s accompanying PowerPoint presentation [PDF] breaks down 127 murders of social leaders, human rights defenders, and activists during 2016. Last Thursday the UN High Commissioner for Human Rights (OHCHR) field office in Colombia released its annual report on human rights in the country, covering 2016. This agency, headed by U.S. expert Todd Howland, maintains 14 field offices around the country, closely monitors the situation, and issues recommendations to the government. The new 18-page report is out in English and Spanish. The Office has also shared video of the March 16 launch and an accompanying PowerPoint presentation [PDF]. Upon reading the report, here are eight points that stood out to me. The situation of male and female human rights defenders continued to cause concern in 2016. 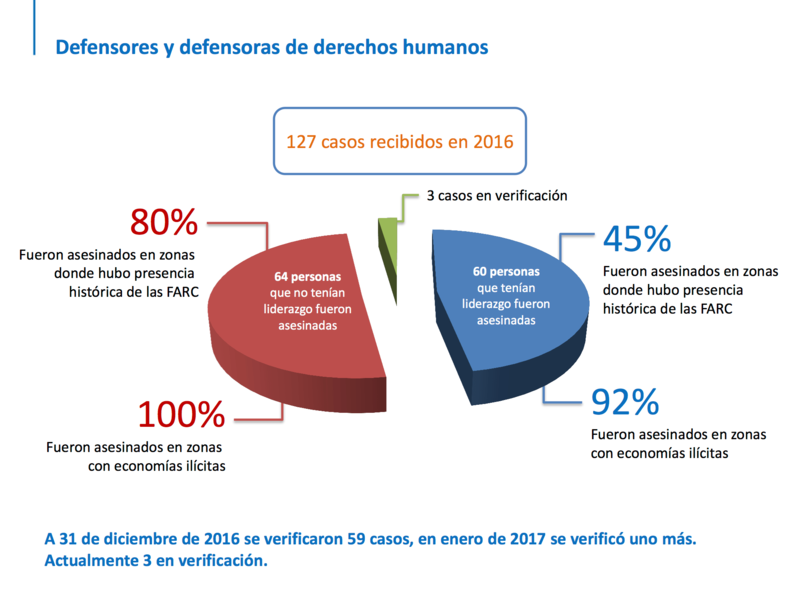 Until 31 December, OHCHR observed 389 aggressions of the following types: 59 killings ; 44 attacks; 210 threats (69 collective); 72 infringements of the rights to privacy and property (including photographing, surveillance, computer theft); three enforced disappearances; and one case of sexual violence. The 59 victims killed included four women, six indigenous leaders, three LGBTI leaders, three trade union leaders, one Afro-Colombian leader and two youth leaders. Although there were more attacks and assassinations of members of trade unions, and social and political movements, these statistics only include aggressions against leaders. OHCHR is concerned about several aspects of a constitutional reform bill applicable to State agents, presented under the fast-track procedure. The bill restricts and distorts the legal framework which judges must apply to alleged human rights violations committed by members of the military or police and does not meet international standards on superior and command responsibility. In the peace agreement, the definition of “effective control” relating to the criminal responsibility of civilian or military superiors is partial and not in accordance with international standards. Effective control, as well as the scope of amnesties, should be interpreted in line with international standards and jurisprudence in order to ensure victims’ rights to justice and non-repetition. The Prosecutor of the International Criminal Court could publicly offer clarity about applicable superior responsibility norms. According to the Attorney General´s Office, in the context of 2,316 open investigations until December 31, 133 members of the military and civilians were convicted between January and September.… Nevertheless, taking into account patterns in planning, commission and cover-up of “false-positive” killings, the responsibility cannot be limited to the material perpetrators. Only one of the 14 army generals currently investigated for these acts was called to trial.… In November, five senior officers implicated in the “false positive” extrajudicial executions committed by soldiers under their command, and who had received various benefits for these “results”, were promoted to brigadier general and major general. At the end of 2016, the temporary pre-grouping zones for FARC-EP members to undergo disarmament and reintegration had not been readied. This generated mistrust and vulnerability among FARC-EP members and provided an incentive for desertion or joining criminal groups. Clearly defined schedules, actions and responsibilities for successful reintegration with public participation are required. OHCHR continued to observe difficulties in implementing economic, social and cultural rights, for example in La Guajira, where nutritional problems primarily affect indigenous Wayúu children. Between January and November, the National Health Institute reported 352 cases of children with low birth weight and 75 deaths from malnutrition, 16 per cent of them under five years, in the department. The humanitarian situation in La Guajira is closely tied to the department’s chronic corruption, as a new documentary by journalist Gonzalo Guillén illustrates. The separation of children from the FARC-EP, agreed by the parties, cannot be postponed. On 10 February, the FARC-EP publically [sic.] confirmed they would end recruitment of children under eighteen. During the year, the FARC-EP only separated 13 children officially from their ranks. The integrated attention and reparation programme for children under 18 years remains under construction. OHCHR is concerned about allegations concerning the separation of children from FARC-EP ranks without official process. In the context of the peace process, the High Commissioner observes with concern the intervention of the military in citizen security tasks ranging from managing public protests to combatting organised crime. OHCHR reiterates that the military is not responsible for citizen security.… In exceptional situations and under established procedures, the national police may require military assistance which, in order to respect life and integrity, should be conducted under the principle of police primacy with rigorous independent civilian oversight.… OHCHR is also concerned about proposals by some local authorities to create vice-mayors for security, exercised by active military members on commission.… OHCHR laments that… the Ministry of Defence decided at the end of 2016 not to reassign financial resources from the military to the national police. Despite the peace process, forced displacement continued. The United Nations High Commissioner for Refugees reported that 47 emergencies stemming from new massive forced displacements, confinements and/or mobility restrictions occurred in 2016. These were concentrated in zones of difficult access in Córdoba, Antioquia, Choco, Valle del Cauca, Cauca, Nariño, Arauca and Norte de Santander. They primarily affected Wounnan, Emberá and Emberá Dovida indigenous, Afro-descendant and campesino communities. Approximately 13,864 people were affected by mass displacement.